The Heritage has been played at the Harbour Town Golf Links in Hilton Head, SC since its inception in 1969. Much has been written about the unique challenge the tight, tree-lined fairways offer and, analytically, this is one of the most interesting tournaments and courses on Tour. Harbour Town has the reputation of favoring short, accurate drivers who can work their way around the narrow fairways and awkward approach shot angles, but it’s important to realize that longer, inaccurate hitters like Stewart Cink, Davis Love III, and Carl Pettersson have won this tournament, Cink and DL3 multiple times. Don’t be snake-charmed by the short hitters among the recent winners – Furyk, McDowell, and Snedeker are all very good in general and Gay won in the midst of a career year in 2009. I’ll discuss later the limitations of a game built on driving distance later, but know that the high distance/low accuracy game is not necessarily disqualified from winning. Harbour Town is a par 71 which has played just short of a stroke over par on average the last three seasons (8th most difficult to par of the regular Tour courses). It builds its defense on narrow fairways, awkward approach angles, and the smallest greens on Tour. Golfers have hit only 56% of their greens since 2011, despite facing no longer than average approach shots and hitting an average number of fairways. In fact, while the Heritage is a short course, the limitations it places on driving distance (2nd shortest drives on Tour in recent seasons) mean that it plays longer than the scorecard would indicate. Add in the test that the narrow fairways and trees provide and the tee-to-green test is one of the sternest on Tour. The highlights are the par 3s; at only the Memorial did the par 3s play more difficult than at Harbour Town. Again, the defense here is not length – the four par 3s rank 30th in length on Tour and none play over 200 yards. Hazards, in the form of water on #4 and #14 and sand on #7 and #17, provide the teeth. The 14th is a particularly brutal carry over water to a long, narrow green. It plays 3.30 strokes overall in 2013, with a 3.51 using the final round pin position last season. The par 5s run the gamut: #2 is short (502 yards) and easily reached in two, #5 is longer, but just as amenable to scoring, and #15 is a 588 yard beast that demands a straight drive to miss the overhanging trees, and it’s lined by bunkers and water down both sides of the fairway. It plays nearly to par, largely because reaching it in two is unthinkable. I performed an analysis of how driving performance (distance and accuracy) has affected scoring using the last three years of data. Methodology can be found in previous tournament previews (Texas, Honda). I’ve performed this type of analysis for most of the PGA Tour courses and Harbour Town is the only one I’ve found in which longer driving distance comes out as a negative. The effect is small, but performing a standard deviation above PGA Tour average in driving distance (~12 yards) has cost players 0.1 strokes/round in the past three tournaments. A similar over-performance in driving accuracy (~5% more fairways hit) has saved players 0.3 strokes/round. Typically, high distance/low accuracy drivers will be around 0.10 strokes/round better than average distance/average accuracy drivers; at Harbour Town those golfers perform around 0.40 strokes/round worse than the average drivers. 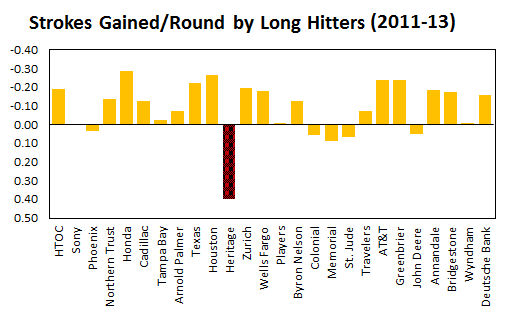 So there definitely is something to the idea of longer hitters being disadvantaged. That may cost some of the longer hitters (Charl Schwartzel and Harris English among the favorites) and reward the most accurate off the tee (Jim Furyk and Zach Johnson). But again, nothing disqualifies Schwartzel or English from winning – driving performance doesn’t play a larger role in determining the winner here compared to other courses. As to why Harbour Town places a penalty on distance, I’d refer you to Mark Broadie’s finding that longer hitters miss more fairways because their misses travel further away from the center of the fairway. On many courses long misses are more often able to be played out of trees or desert areas; at Harbour Town, carrying a miss ten yards further off-line means you’re hitting a recovery shot much more often than normal. Even a small miss may leave a golfer without a usable angle to the green for their approach shot. This shows the advantage, solely from driving distance & accuracy performance, that long/inaccurate hitters have over average length/average accuracy drivers per round. Negative numbers indicate strokes gained on the field. I’ve done some limited collection of going for the green data just from the 2013 Final Round, and Harbour Town offers fewer opportunities to go for the green and less chances for success hitting the green in two than a normal course. Much of a longer hitter’s advantage comes in their ability to reach the green or around the green in two shots on a par 5. This allows them to putt for eagle or play a short shot (<30 yards) on their third shot, while shorter hitters are forced to lay-up and play longer third shots from 75-125 yards. On average, Tour pros score nearly half a stroke better per hole when they go for the green (hit the 2nd shot within 30 yards of the green) on par 5s, as opposed to laying up further back. There are certainly selection effects in that golfers go for greens on easier holes and don’t on harder holes, but in general it makes sense that going for the green is the superior play – if you are able. Whether a golfer can go for the green largely depends on how far they drive the ball. 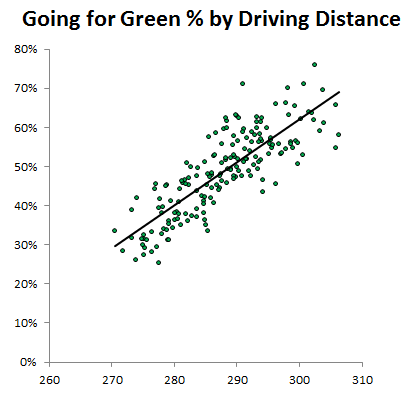 The first graph below shows the relationship between Going for the Green % (percent of par 5s where a going for the green shot was played) and driving distance for all qualifying golfers in 2013 using all tournament rounds with the Shot Link system. The longer hitters (>295 yards) go for the green 60% or more, while the shorter hitters (<283 yards) go for the green 40% or less. There’s also a clear relationship between Going for the Green % and overall par 5 scoring average. The chart below shows that the longest hitters, who can go for the green the most, gain around 0.06 strokes/par 5 on average hitters and around 0.12 strokes/par 5 on the shortest hitters. That is a small advantage, even added up over 2-4 par 5s/round, but it forms around 20% of the advantage Bubba Watson and Dustin Johnson have over the field. Overall, Tour pros go for the green on around 50% of their opportunities and successfully hit the green around 25% of the time. At Harbour Town, golfers almost all go for the 2nd green (76%), while rarely attempting to take on the 5th green (21%). No one went for the 15th green in two. All told, my sample only went for 32% of the greens I measured and, of those, only successfully hit the green 15% of the time. These numbers are obviously well short of the averages I quoted above. This may indicate that Harbour Town eliminates the advantage longer hitters have in being able to go for par 5 greens in two. The 2nd hole is accessible to almost every Tour pro, while the 15th is accessible to none of the pros. That would limit the advantage long hitters gain to only the 5th hole. This is certainly an area that deserves more investigation.